In the middle of the night on April 15, 1848, Emily Edmonson and five of her thirteen siblings, sneaked out of their masters' homes in Washington, D.C., and boarded the Pearl. If all went well, they and 70 other slaves would disembark three to five days later at Frenchtown Wharf, Maryland and then travel the 16 miles to Philadelphia, where they would be free. Unfortunately, when their absence was discovered the next morning, a disgruntled free black man named Judson Diggs, angry that two of the women escapees had not paid him for a carriage ride, pointed the search party in the right direction. Bad weather had forced the Pearl to weigh anchor at the end of Chesapeake Bay and the search party, in a steamboat, was able to catch up despite their head start. The runaways were taken back to Washington, D.C. where they were all jailed until their owners could claim them. Eventually, many of them, including Emily and her siblings, would be sent with a slave trader down to New Orleans to sell, possibly into field work or even prostitution, as their owners no longer trusted them not to run away. Emily and her sister Mary were shipped back to Maryland to avoid a yellow fever epidemic that had broken out and their father, Paul Edmonson, pleaded with the slave trader to allow him to purchase his daughters. The price of $2,250 was set. Paul asked everyone he knew for help raising the money, and finally some abolitionist sympathizers helped him travel to New York City to try to raise the funds. There he met Rev. Henry Ward Beecher, who was horrified to hear of the fate that awaited the Edmonson sisters. His fiery preaching about "two devout and virginal christian girls who faced a life of prostitution in the South if he and his congregation failed to act" motivated the donation of the needed money and the girls were freed. They traveled to New York to thank their benefactors, to gain an education, and to fight slavery. Ultimately, thirteen of the fourteen Edmonson children would be freed. The last one, John, was sold in New Orleans, and nothing further is known of his fate. The captain and crew of the Pearl were arrested and charged with larceny for stealing and transporting slaves, and bail set at the astronomical amount of $76,000, an even thousand dollars for each slave. Three months after the escape attempt, Daniel Drayton, the captain and primary planner of the escape, was sentenced to 20 years at hard labor and fined a total of $10,360. While he would be released by presidential pardon after only four years and four months in prison, his health would be affected for the rest of his life and he would eventually commit suicide only five years later. 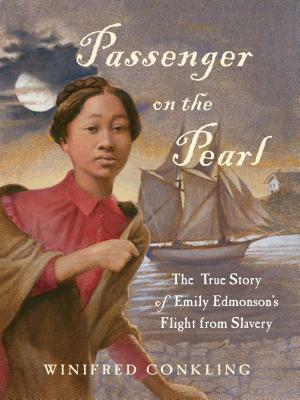 Winifred Conkling condensed an enormous amount of information regarding the Pearl incident; political, social, cultural, economic, and historical context; the specifics of slavery in Washington, D.C.; and the life of slaves in general into this short middle-grade book. Sidebars cover topics like yellow fever, the Fugitive Slave Act, the American Anti-Slavery Society, terminology, and sorrow songs in greater detail. I especially appreciate the tie-ins to Harriet Beecher Stowe (Rev. Henry Beecher's sister) and how Emily's story influenced the ground-breaking novel Uncle Tom's Cabin. Period illustrations include lithographs, newspaper advertisements, paintings, shipping manifests, and wood engravings that emphasize the reality and human cost of slavery. Be warned: there are some disturbing photos, and other illustrations, as well. By using the ultimately positive story of Emily Edmonson as the scaffolding for this book, Conkling both makes it more real and immediate for the reader and allows enough distance from the most traumatic descriptions of slavery that young, tender readers aren't overwhelmed. But be prepared to discuss this book and these heavy topics with your child.